Book a Private Normandy Tour from Paris to the D-Day sites of Normandy. Your tour to the Normandy invasion beaches will start around 6:30 AM with a Paris hotel or apartment pickup by your driver guide. While your itinerary is flexible within the 12 hour day, this is our suggested itinerary. The first stop on your Normandy Private Tour from Paris is Pointe du Hoc, where members of the United States 2nd Ranger Battalion scaled the cliffs to attack a German gun battery during the Battle of Normandy. Your Normandy Private Tour from Paris continues to Colleville-sur-Mer and stops at the American Cemetery, which overlooks Omaha Beach. Explore the Visitors Center and the Cemetery. If time permits, walk down the path from the American Cemetery to Omaha Beach. The next stop on your tour is the German artillery battery at Longue-sur-Mer. You will continue to Arromanches, the location of Gold Beach, another of the Normandy beaches, to see the remains of Churchill’s Mulberry Harbor. 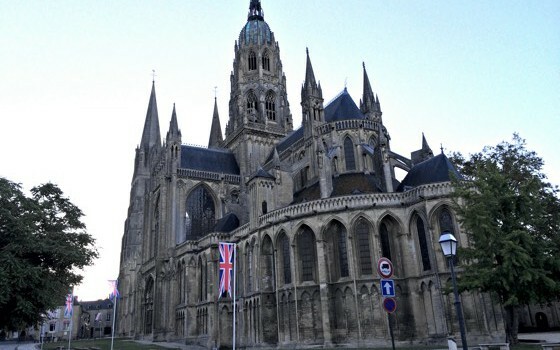 The Bayeux Tapestry (located in the town of Bayeux close to Omaha Beach) can be included in this day. Just let us know and the guide will take you there. 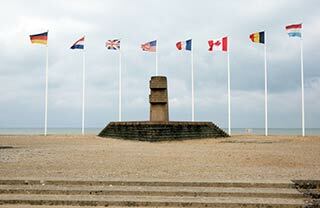 If you wish a private Canadian D-Day tour, we can arrange to visit Juno Beach and other Canadian places of interest. The vehicle is a sedan or deluxe air-conditioned minibus (or larger if a large group). Entrances and meals aren’t included in the cost for the private tours. This Normandy Private Tour from Paris will leave you with lasting impressions about the Allied Invasion of Normandy on June 6, 1944.